H2O For Life and Lifewater connect schools around the world. 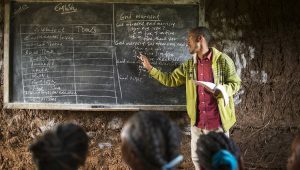 For nearly five years Lifewater has worked with H2O For Life to connect students in North America with students in Africa and Asia promoting the idea of students helping students get safe water. Through year-long education and fundraising efforts in North American classrooms and schools, children have helped to bring safe water, sanitation, and hygiene to children in need in Ethiopia and Democratic Republic of Congo (DRC). H2O For Life is an organization that recruits and equips classrooms and schools in North America to help other students around the world get safe water, improved sanitation, and hygiene education. A group of students helping students commit to learning about the global water and sanitation crisis and raise enough money over the course of the year to help another class or school get safe water. So far, children have donated $75,000 to schools in Africa through Lifewater. In Least Developed Countries (LDCs), only half of schools have access to safe water or sanitation. That means students have to walk long distances to get water, and often must wander into the bush to relieve themselves. Access to WASH in primary and secondary schools increases school enrollment because it decreases the burden of labor and disease on children. Furthermore, it decreases inequalities in enrollment by providing for the dignity and safety of all children at school, especially girls and children with disabilities. Lifewater implements a WASH in Schools program which provides access to safe water, improved sanitation, and hygiene education to students and teachers. Beginning in 2012, students raised money for two schools in Ethiopia to receive a new safe water source, blocks of latrines, and hygiene education (WASH in Schools). Students helping students in these schools also started WASH clubs, which use peer education to encourage healthy behaviors. Their peers in North America continued fundraising for several more schools since 2012 in Ethiopia and DRC, including 2 more schools in Ethiopia in 2016. This coming year, students working with H2O For Life will be raising money for a school in Ethiopia and Cambodia.